Last May, Star Tours in Hollywood Studios was updated with new characters, locations, and put the Starspeeder 1000 spacecraft to the test, using more of what the ship can actually handle. The changes were twenty five years in the making. 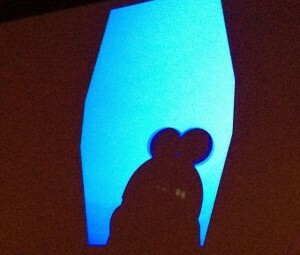 Some of the best parts of attending Star Tours: The Adventure Continues was learning the Easter eggs of the ride. 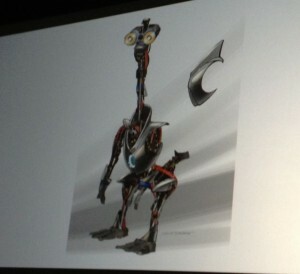 The Goose Droids, or the G2 Repair Droids, are actually recycled parts from a Disneyland classic, America Sings! Parts were removed and feathers were plucked to produce this wonderful addition to the Star Tours queue. Baggage Check is not normally a humorous place but it certainly can be at Star Tours. If you stand long enough and watch the luggage go by, you may see Buzz, Droid legs, the Sorcerers hat, the plant in the boot from Wall-E, Madame Leota, and many other odd items. As you continue to walk through the queue, look up at the silhouette screen to see some of the visitors flying on Star Tours, including one special guest with Mickey ears. As different locations were proposed, different scenarios unfolded. 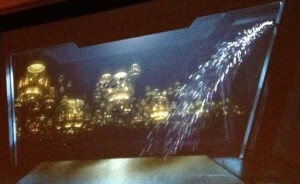 One scenario that did not make it to the final version of Star Tours is the chance of water leaking into the Starspeeder 1000. This was an exciting but wet and costly idea. 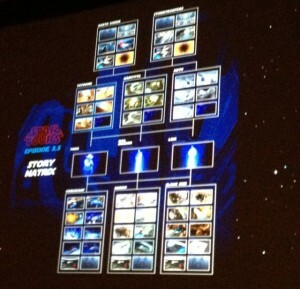 Guests could ride Star Tours over two hundred times and possibly never see the same combination of events or characters. The combinations are almost endless! I tend to see similar scenes so I have my own theories about how many are actually being randomly selected, but the possibility is still there. Many passengers of the pre boarding show are Disney Imaginers and their family members. 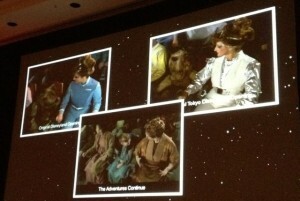 There is one lady that appears in the original opening at Disneyland, Tokyo Disneyland, and The Adventures Continues. Can you guess her name? If you leave her name in the comment section, more Easter eggs will be revealed. 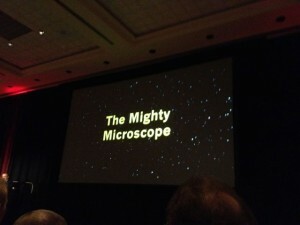 Hidden in the Star Tours film is The Mighty Microscope, which was a prop from Adventure Thru Inner Space. It appears for only a short time so guests must pay attention and be looking for it. 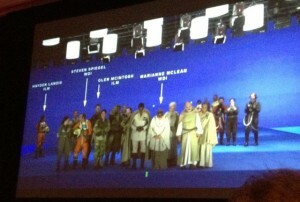 On one of the landings, guests are able to see some of the “backstage” people. They appear to be excited to see you land safely, but really some are just as excited to wear the costumes! Steven Spiegel and Marianne McLean from WDI and Hayden Landis and Glenn McIntosh from ILM are part of the welcoming committee. 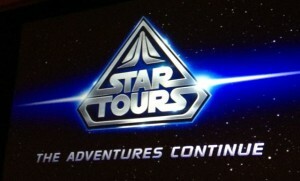 Riding Star Tours tonight gave us a chance to “see” it in a whole new light. Buzz appeared in a suitcase but we didn’t get to see the droid with the Mickey Ears walk by. 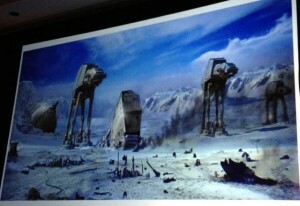 We visited Hoth, fought a Bounty Hunter in an astroid field, and were able to point out Steven Spiegel, who we just saw at Star Wars Celebration VI. What a ride! 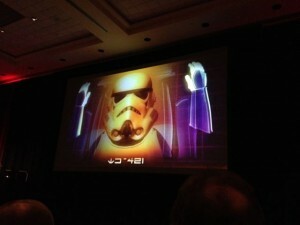 It is so awesome that you met the person who was in the new Star Tours at Star Wars Celebration V.